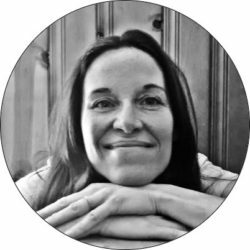 Carreen has worked in the language industry for over 20 years and has extensive experience as a translator, localization specialist, editor, copywriter, and educational researcher. Carreen goes above and beyond to research and deliver engaging, polished, and informative content often with a unique and entertaining twist. Carreen’s passion for language truly borders on the obsessive so she fits right in with the Nimdzi team! 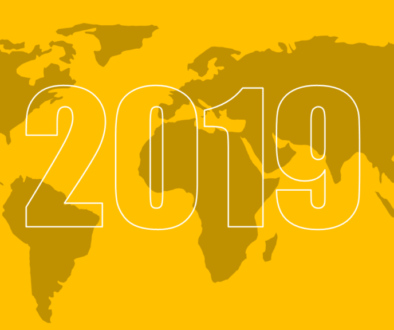 Almost 110 years ago, the United States celebrated the very first National Women’s Day, and soon after, both in the United States and in Europe, similar celebrations and marches would begin, focusing primarily on labor movements and unfair working conditions. Since then, International Women’s Day is celebrated annually around the globe in support of women’s achievements on the political, scientific, economic, and social fronts. However, despite this impressive over-100-year span, there still seems to be disparaging differences among the sexes, especially where income and professional leadership roles are concerned. When women read about gender pay gap, we react – it upsets us to think that we are unfairly treated in the workforce simply because of our gender. I for instance, not only hold a B.A. in French Language and Literature, but also an Ms.Ed. I hold two teaching certifications in Ontario, and three in New York State. I have an extensive teaching background in French Immersion and Special Education, professional translation, copywriting, editing, and more. I speak two languages and have been an over-achiever my entire life. And yet, I seem to always undersell myself when it comes to my deserved income. 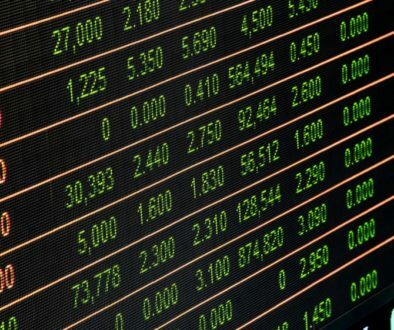 I tend to be very conservative when I bid for contract positions and am begrudgingly willing to accept a lower-than-average financial compensation for my services – if you are a woman reading this, I have a strong suspicion that you can relate. So why? Why do we tend to feed into the gender pay gap? Are we programmed from an early age to feel inferior to men in the workplace? After all, we have all been accustomed to view men in positions of power – leaders of countries, heads of corporations, and even lead roles in the entertainment business. With this cultural, social, and political saturation, has our collective psyche been so influenced, that we subconsciously consider our professional place, as lower than that of a man’s? I decided to ask some pointed questions to 20 women and 20 men in both Canada and the United States. I asked about their level of education, their profession, the gender ratio in their workplace, leadership opportunities, salary differences, and discrimination issues. What I found out wasn’t necessarily shocking, but it was disheartening. It seems that even with the gains we’ve made, there is still a long way to go to close the gender pay gap and equal the playing field in terms of developing and maintaining respectful, safe working conditions. 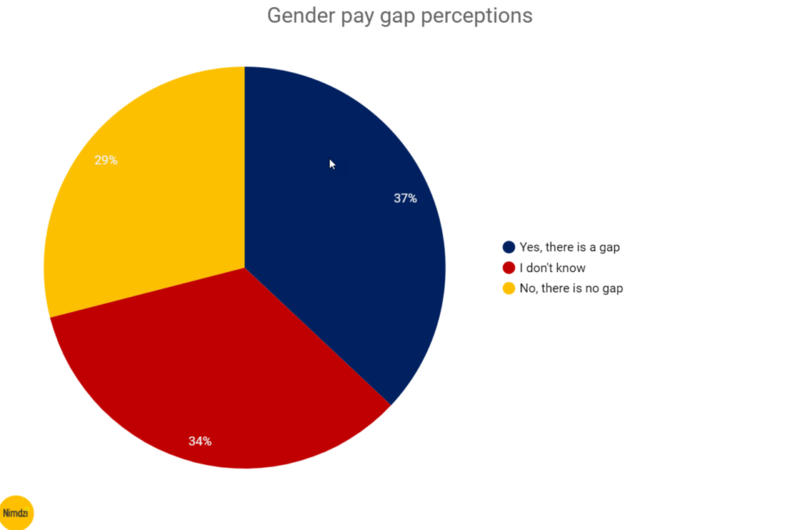 This graph demonstrates that a significantly larger percentage of women than of men, tend to believe there might be a gender pay gap within their organization or within their profession. In fact, the differences here are almost polar opposite, suggesting that in the workforce, men and women’s experiences couldn’t be farther apart. Is it that because women are on the losing end of this scenario, we are more in tune, whereas since men don’t seem to be negatively impacted, they are just not paying close enough attention? Two very interesting patterns began to unfold when respondents were asked to explain why they felt one way or the other on the subject of gender pay gap. One pattern dealt with the high-level of secrecy regarding employee salaries. Many respondents went so far as to reveal that asking colleagues about their salaries or comparing salaries was strictly forbidden, and one respondent believed that this was clearly a tactic to prevent anyone from asking for – or even feeling deserved of – a salary adjustment. The other pattern started to unfold when examining the male responses. 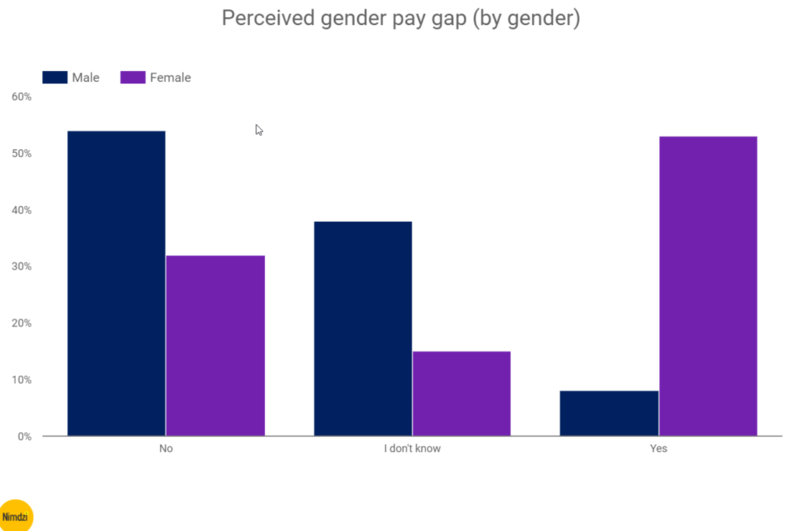 Many men who claimed they didn’t know whether or not there was a gender pay gap, or who definitively knew there wasn’t, based their responses on the fact that there just weren’t any women in their company or in their industry, or that the number of women was just so low that the gender pay gap for them, was a non-issue. Of course, this leads to other questions about perceived appropriate professions based on gender stereotypes, but I’ll get into that a little later on. 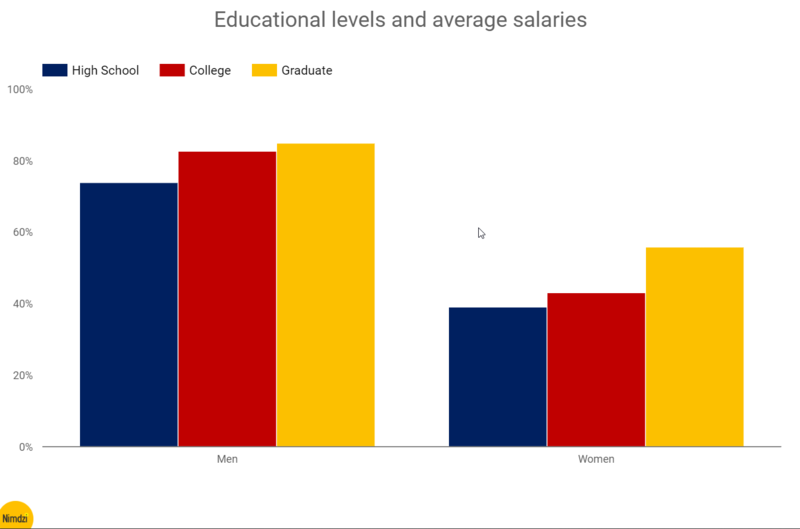 For the men and women respondents with a high school or college education, there is almost a 50 percent salary difference between the genders. The pay gap narrows for those with graduate degrees, but according to this study, men are still averaging roughly 34 percent more than women. The picture didn’t get any brighter the further I dug into the data. When I took a look at the ratio of male to female employees in the respective organizations and compared this to the number of men in leadership roles, I noticed a disproportionate number of men holding leadership roles. This was particularly true in the restaurant and business sectors, but certain industries within education and the medical professional also revealed this disproportionate ratio. Speech language pathology for instance, demonstrated a larger number of female employees but more men in leadership positions. The same was true in nutritional therapy and veterinary medicine. It also seems as though the gender stereotypes – although starting to change – are still holding strong. There are many more female registered nurses than there are men, and males continue to dominate the machining and construction industries, as well as finance, accounting, and IT. In all your years of experience, have you ever felt discriminated against in the workforce because of your gender? Yes, that’s right. Your eyes aren’t deceiving you. 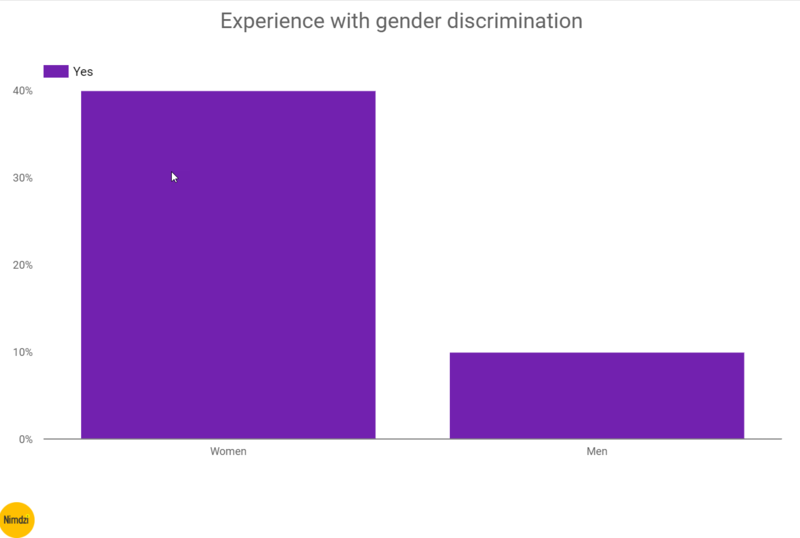 Not a single man reported any gender discrimination, and although I was expecting the percentage of women to be higher, 40 percent is still 40 percent too much. Ok, enough of the dark stuff and time for some promising signs. Out of the 20 men who took the survey, nearly every single male reported being aware of the uneven playing field that women still face. They talked about institutionalized discrimination, the long-engrained subconscious ideas of male dominance in – and out of – the workforce, and the added responsibility women have of being the primary caregivers to the family as a whole, to their children, and their aging parents. The data indicated that men have a keen awareness of the issues that women still face and how they are working incredibly hard to find innovative ways to balance family life and their careers. And things are changing. They are. There are growing numbers of women in the fields of human resources, accounting, business, and finance, and at the tail end of 2017, the Association of American Medical Colleges reported that for the first time in history, there were more women enrolled in medical schools in the United States than there were men. According to the US Department of Education, in the fall of 2017, almost 60 percent of college enrollees nationwide were female. Women continue to ride the waves and brave the waters, and we do so while continuing to balance our family life. Let’s work together to keep the discussion going. You can help by taking 2 minutes to complete and submit the below quick survey.